As you may know, we have spent the last year with a severe back order problem for our machines with lead times up to 12 weeks. It was a combination of high demand and trying to find people who are willing to work. We think we have our problems solved and our current lead times are running 3 to 4 weeks. We believe by March they will be back to normal where we can ship any machine within one week. While we have been working hard to fix our back order situation, some of our suppliers are getting worse. 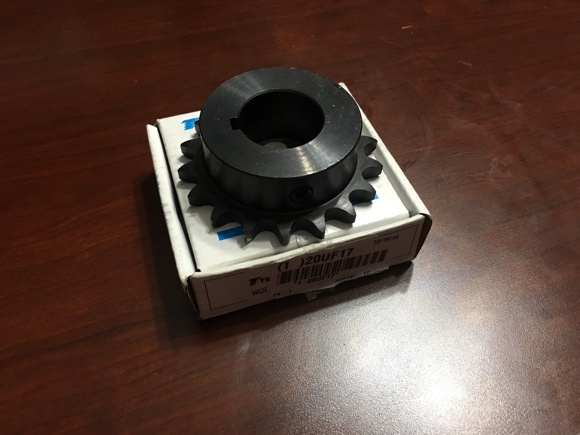 The piece above is a chain sprocket we use on our Simplex 500 Lift Table. We went to order it a few weeks ago and was told that delivery would not be until April 2019. This is an item that is normally in stock and we receive it a few days after we order it. Martin manufactures the sprocket that we normally buy from MSC so we looked at other suppliers that stock Martin Gear products. It was the same everywhere. This sprocket was completely sold out nationwide. I realized that the sprocket is a generic item that we might be able to get from a different manufacturer. We get our roller chain from Tsubaki, so I checked them out. Not only did they have the sprockets but they had it with the finished bore size we need. We had to bore and re-key the Martin sprocket. Needless to say, we are permanently switching to the Tsubaki sprocket. That back order ended well but the worst one is our spin grinding stone that we get from Norton. Norton is usually a very good company to work with and they can be very helpful. We normally get the stones about 6 weeks after we order them. Norton let us know that they were busy, so we ordered these stones a month earlier than we normally would have. We should have gotten them in the middle of October. Between October and December, they gave us five different ship dates and missed them all. After they missed the third one, all we could do is tell our customers we can not tell you anything until we actually have them. The week before Christmas, I made a very dramatic plea. A few days later, they sent out 10% of what we originally ordered with no date for the balance. Half of that balance is already sold and we are now ready to place the next order. We kept a few in stock for use on new machines but I do not know when we will have more to ship. It is frustrating to finally solve our back order problem only to have a supplier create a new one, one we can’t fix. Oh yeah, Happy Friggin New Year. Merry Christmas and Happy Holidays from all of us at SIP Corporation. I have talked previously in this blog about adding LED shop lights to both the welding shop and the assembly area. 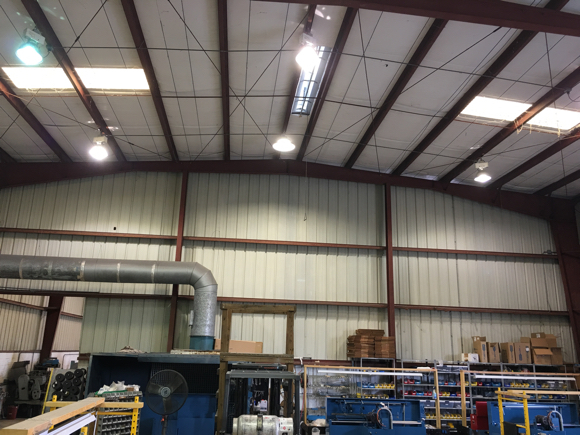 The assembly area and machine shop are already pretty well lit with high bay metal halide fixtures, each putting out about 36,000 lumens. We have nine fixtures in each covering about 3,000 square feet with a ceiling height of 24 feet. While these provide good general light, the LED shop lights installed over the work areas was a real improvement. The metal halide lights have proven to be a significant maintenance issue, almost as bad as fluorescent lights. The manufacturer shipped them with undersized, cheap capacitors which all had to be replaced with larger ones within the first 18 months. Each fixture also has a transformer which only lasts 4 to 6 years. The bulb and larger capacitors have similar lives. So 18 fixtures each with 3 components that can fail every 6 years. That means on average, each light will need a repair every 24 months. Divide that by 18 fixtures and you end up repairing a light about every 2 months. 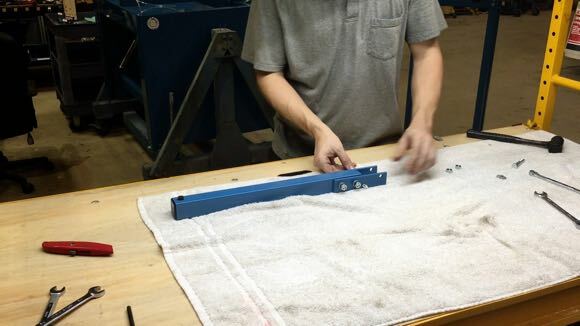 This means you have to buy or stock the components, attach the man lift to the fork lift, remove the fixture to a work bench, make the repair and finally replace the fixture. 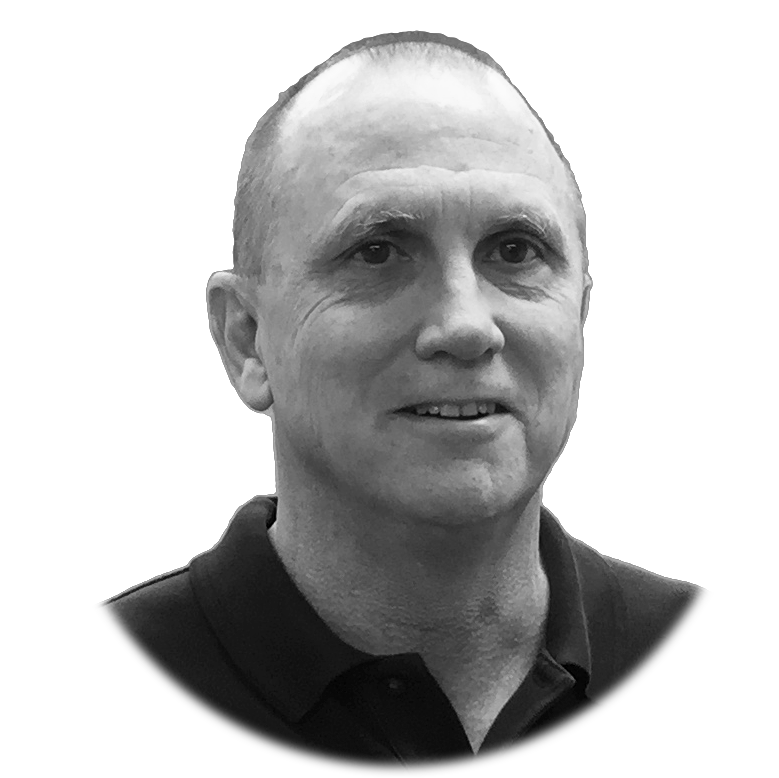 You don’t want to do everything all at once because the cost of the components for each fixture is around $80 times 18 or about $1,500 every five years. Two other issues with the metal halide lights is that they do not come on right away, they have to warm up. If we loose power (a frequent occurrence in Florida) they have to cool off before they will come back on, which can take up to 30 minutes. Also, when the transformer is beginning to fail, it buzzes loudly, which is very annoying. But there is hope. LED technology is advancing rapidly and costs are dropping dramatically. I found a source for a 36,000 lumen high bay LED light for $160. These lights come with a 5 year warranty. They are instant on and make no noise. They can also plug into any voltage between 100V and 270V. They use 160 fewer watts for the same amount of light which results in a $50 per year savings on electricity. Add to that about $15 per year on parts and you have a payback in about 2-½ years. We replaced the first one (the middle one in the above photo) and even though it is rated the same, it seems brighter. As the metal halides continue to fail, we will be replacing them all with the LEDs. We figure it will take about 2 years. I often joke that as the owner, I do anything and everything including sweeping and mopping the floors. Yes I do sweep and mop the floors but I also do all of the IT (information technology) stuff. We are all Apple so that makes it a little easier. One of the best things about Apple computers is that the system software updates are free and almost always improve performance. So I wait until a few weeks after the upgrade is available to make sure it is okay then I install it on my computer. If that is good, then I install it on every one else’s. I also have all of the computers backed up locally using Time Machine. The important computers have multiple hard drives that are used alternately every hour. I also have cloud back up which is done continuously. During one of these upgrade sessions, the accounting computer would not allow me to upgrade the system because it had determined that the hard drive was about to fail. 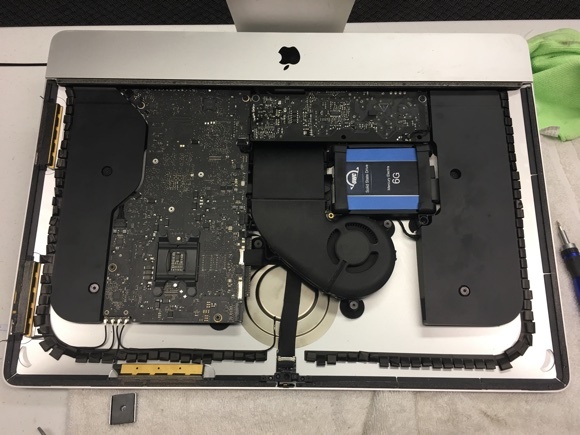 This computer is an iMac and is fully sealed with no “user serviceable parts”. I called the Apple Store to find out how much it would cost to replace the hard drive but all they would tell me is to bring it in so they could give me an estimate. I thought that sucked, so I decided to look elsewhere. Other local shops gave me the same run around. I went on line and found Other World Computing, which makes kits for replacing drives in iMacs. The best part is that they make a kit with a 1 terabyte solid state drive with all of the tools required for the installation. The kit sells for about $200 and which they claim can be up to 92 times faster than the original drive. They also have excellent step by step how to videos. After watching the videos a couple of times, I decided I was game. This required that I cut through the adhesive tape that bonds the screen to the computer housing then remove most of the internal components to get to the underside of the logic board, or so I thought. I watched the wrong video and had removed a lot more than I needed too. After putting it all back, the hard drive replacement was easy. Even re-bonding the screen in place was not too difficult. Once back together, I had to restore the new solid state drive from one of my Time Machine back ups, which also went very smoothly. The hardware install took about two hours but would have only taken one if I had watched the correct video. The restoration took a couple more hours. The results were impressive. Everything that required drive access was significantly faster, especially in our Filemaker Database. It was so much better that I decided to upgrade the rest of our iMacs. 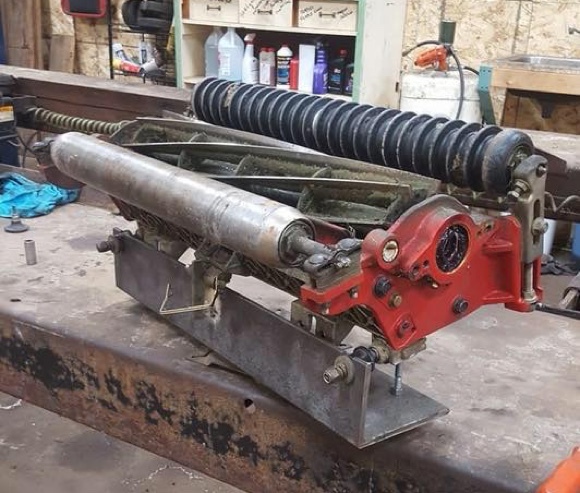 If you have ever ground the QA7 with the spiral roller on our reel grinder, you know it is a little tricky to keep the roller from falling into the slot on the front reel support rail. We made the above adaptors from cold rolled sheet steel which is cut and deburred. It is then sent out to be zinc plated. Once we get it back, we take it to the arbor press and gently straighten it. Finally we epoxy bond two extra thick quarter inch washers so that they will align in the slots of the front reel support rails. This should eliminate the tricky spiral roller problem. Let me know if you think I should make this an option for the Peerless 7000. I don’t have a price yet but I am guessing around $25. 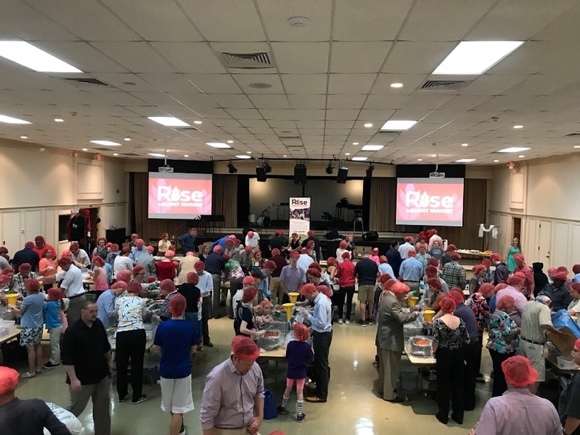 Twice a year, our church meets in the Fellowship Hall after the service to pack meals for Rise Against Hunger. This is an organization dedicated to ending hunger by 2030. We first raise about $3,000 which provides us with the ingredients for 10,000 meals. 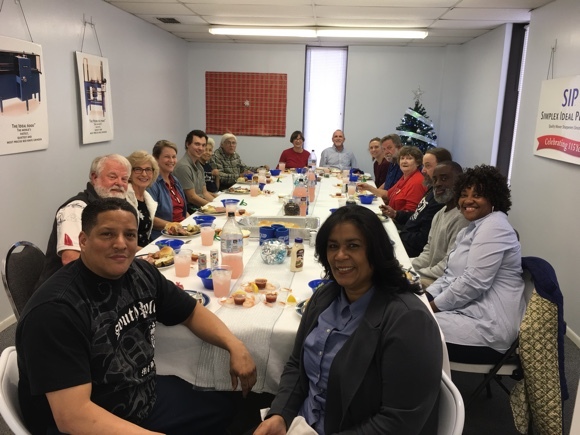 Then Rise Against Hunger delivers the ingredients, equipment and supervision to our Fellowship Hall. 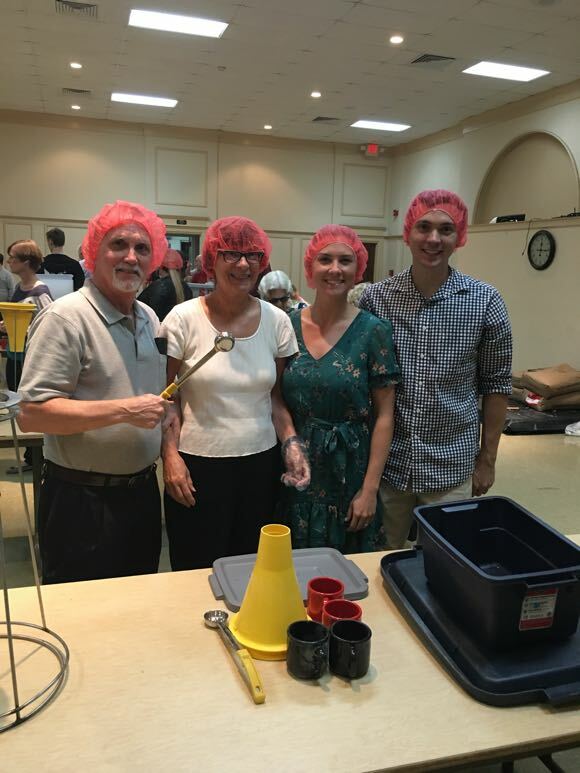 We make our way to one of four types of stations and don our hair nets and plastic gloves. The first station has bins filled with rice, soy protein, herbs and vitamins. There is a funnel system and plastic bags. Each person takes their position and scoops the ingredients into the funnel with a bag below. Once a tray has been filled with bags, a runner picks them up and takes them to the next station where they get weighed. Rice can be added or taken away to keep them in the correct range. They are then handed across the table to the third station where the bags are sealed. Finally, runners will transport trays of sealed bags to the boxing station. There are also runners distributing the ingredients from 50 pound bags to the initial packaging station. Finally finished the air powered grinder for the Amish customer in Ohio. It actually works pretty well but you have to make sure that you get plenty of air to it. Also remember that Monday is Veteran's Day and to observe two minutes of silence in honor of the service and sacrifice of veterans throughout the history of the Nation, beginning at 11 AM. While I am on the subject of letting you now about ALL of the improvements we make, here is the new shelf for our racks. I doesn’t really change the function of the racks but it does reduce our cost so we can do a little better than just break even on this item. The old shelf had a welded pad on the shelf end that would sandwich the column with another pad. The new shelf uses two loose pads and the leverage on the shelf to lock it in place. 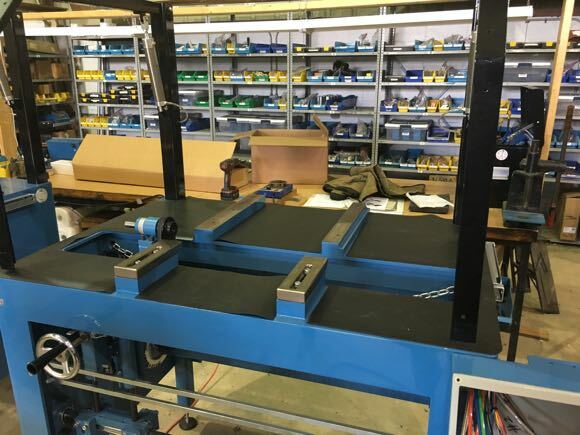 It is quite a bit cheaper to drill two extra holes in the pads then it is to weld one pad on the end of the shelf… twelve times for each rack. You can follow this link to watch a video on how to assemble the rack. 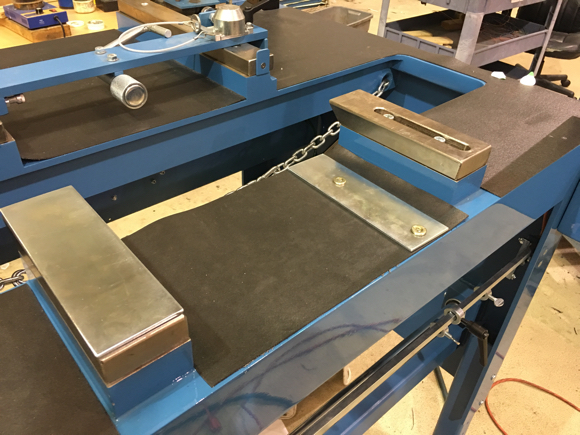 Even though it is only about five feet, you can store up to eleven cutting units on it This is because the shelf design allows you to have infinite gap adjustability. For more info, follow this link. Seriously, most of the significant improvements I make are listed in this blog. I have missed a few which I did not think were significant, so I will try to do a better job of keeping everyone informed about these improvements. The improvement that created this brouhaha is the protective mat for the top of the Peerless 7000. I haven’t even made it an official product… until now. Part number 77397-01 7000 Mat Kit will sell for $97. Or you can go to Lowe’s and buy drawer liner, part number 757590 and Command Poster Strips, part number, 73430 for less than $20 and make your own. I hope you are happy now, Larry and Stephen. You may not know that one of my favorite pastimes is cooking. It all started when we had our house remodeled in 2001. I wanted to put in a gas range and Michele was against it. Her childhood home burned to the ground a few years after she move out when the owner installed, gas hot water heater blew up. I promised her that if we put in the stove that I would help with the cooking. The number of meals she has cooked since then can be counted on two hands. One of the great things about living in Tampa is the Cuban food. My favorite Cuban meal is a Cuban Sandwich with a crab roll on the side. While I love to cook, I pass on dishes that require exotic ingredients or special equipment. This is why I went out to eat when I wanted my Cuban Sandwich and crab roll. 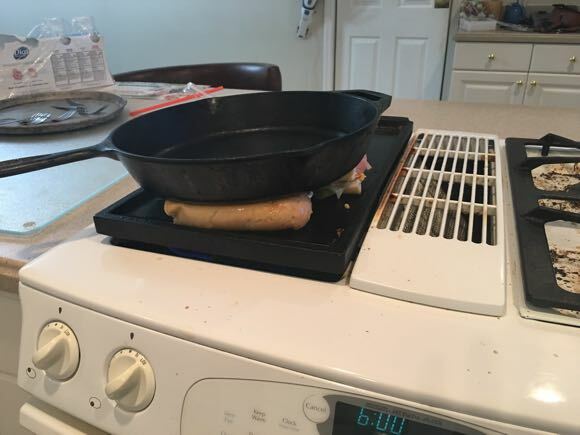 I do not have a sandwich press or a deep fryer. My go to Cuban restaurant was recently sold. After that it was always out of crab rolls. A Cuban restaurant closer to my house was trying to build a franchise, but the food was mediocre. The really good Cuban restaurants are a little too far away for a quick meal and most of them are not open for dinner. So I decided to try my hand at it. I make a pork loin roast which I slather with garlic paste and salt then roast or grill to 135°. I know I may die from undercooked pork, but it is worth it. The pork comes out juicy and tender. I bake some sweet potatoes at the same time. When done, they are easily removed from the skins, combined with brown sugar, butter and cream and then mashed. I mix a quarter cup of mango jam with a couple tablespoons of horseradish sauce and then nuke it in the microwave for about a minute. The sauce is spooned on a plate and topped with three medallions of the pork loin. The sweet potatoes are added and topped with fresh blueberries. It is delicious. I know you are asking “What does this have to do with a Cuban sandwich?” I am getting there. The secret to a great Cuban sandwich is the bread and the pork. The left over roast from the above dish is perfect. Add to that fresh baked Cuban bread, some Boar’s Head ham, Swiss cheese and dill pickles and you are ready to make a Cuban. You can not get crab rolls at the grocery store and they are impossibly difficult to make, but I found the frozen crab cakes are a good stand in. I turn the heat on medium on both my griddle and my cast iron skillet. Once the griddle is hot, I add butter and the thawed crab cakes which will cook about 3-4 minutes per side. I then cut the Cuban bread into sandwich sized pieces then split them. I coat the outside with butter and the inside with mayonnaise. I slice the roast pork about a sixteenth inch thick and warm it and the ham in the microwave. I then lay the pork, and ham on the bread, add a bit of yellow mustard then top with Swiss cheese and dill pickles. By this time the crab cakes are almost done so I put the Cubans on the griddle then press them with the skillet while I let the crab cakes finish. When the bread is crispy and the cheese has melted, they are ready. I may be deluded but I will put that sandwich up against anybody’s. As part of our upgrade to the assembly area, I am creating a specialized tool box for each station. You may remember that I originally had peg boards but that did not work out. I looked for boxes at Northern Tool (too expensive), Harbor Freight (too cheap), and Lowes (not the right kind). Did you know that Lowes now carries Craftsman tools? This was a Sears exclusive brand for tools. It was used by serious hobbyist and some professionals. Their tools came with a lifetime warranty, even if you broke it on purpose. I have Craftsman wrenches that I inherited from my Dad that are older than me. So I went to Sears to look. It broke my heart. It seemed that their tool department was one quarter the size of what I remembered with no where near the selection. They did have the tool boxes I wanted on sale but not in stock. I ordered them and got them the next week. Sears was the original Amazon. We got their annual mail order catalog that was three inches thick. I would spend hours as a kid day dreaming about what I could do with stuff they had. 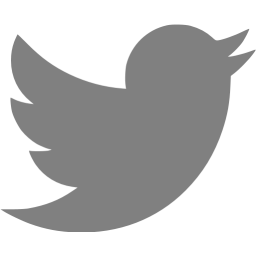 I still remember bird cannons. You would load a shell into it, pull a string to fire it so that it would make a loud noise and scare the birds away from your crop or garden. Did you know that you could by a kit from Sears with everything you needed to build a house. It would arrive by train and all you needed to add was the labor. Sears sold these homes from 1908 to 1940. Sears also made their own cars from 1908 to 1912 which were also available via mail order, delivered by train and required some assembly. Today, Sears is on the verge of bankruptcy. At their peak in 2005, after the merger with K-Mart, they had over 3,500 stores. Today, it is less than 900. If instead of buying K-Mart, they had invested in internet sales, they could have been Amazon. It was in their DNA. Sears was started in the 1880’s, close to the same time the Root Brothers Manufacturing was founded. According to the museum sign above, we were competitors. Our company originally made shoe lasts and leather working kits. The SIP Grinder Division wasn’t added until 1902 and they were the market leader until the 1960s or 1970s. 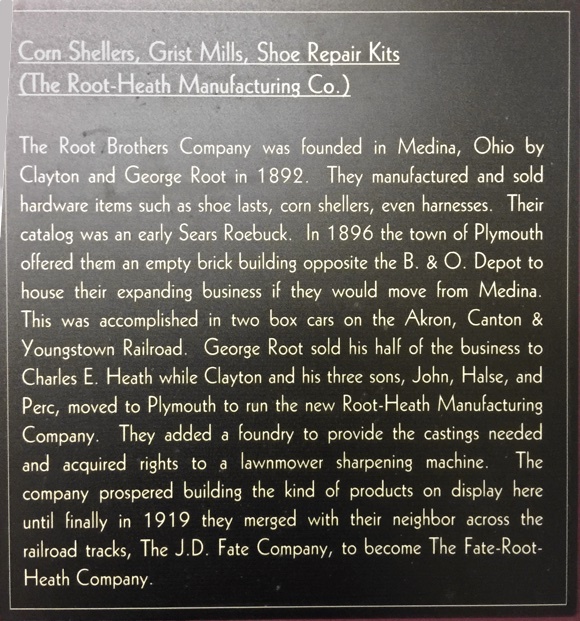 The Root brothers, the sons of the founding Root Brothers, both died in the 1960s and all of the divisions of what was then the Fate Root Heath Company were sold off. That company had made trucks, cars, tractors, yard locomotives and ceramic and concrete extrusion machinery as well as lawn mower sharpeners. Today, the SIP Division is the only one left still making products. It hasn’t been easy. We do it by innovation. We don’t just add new “me-too” products. When we add a new product, it has to be significantly better than anything else. We are an engineering driven company that listens to our customers. That’s where we get our ideas. Thanks. 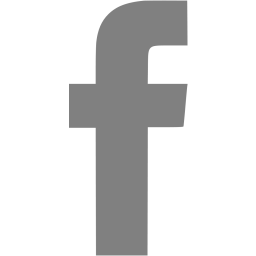 This Facebook page is a great resource for anyone who is responsible for maintaining equipment on a golf course. You can ask for help, pass on tips and share any relevant information. Turf Addict is partnering with SIP to sponsor their Photo of the Month contest. So join, login, and share your photos and you may win a Pi Tape.